University graduates across the UK are celebrating their last summer of freedom while eagerly or nervously waiting on final results. 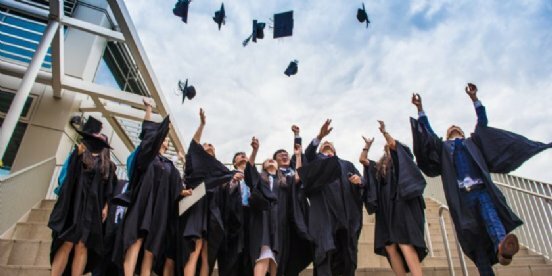 It’s a busy and overwhelming time of year with graduation ceremonies to prepare for as proud family and friends watch on - not to mention planning for the next chapter in life. If you haven’t already thought about a career path, now’s certainly the time! We are London’s most established recruitment specialist to the Conference, Exhibitions and Events industry. Recruiting across a variety of positions in Conference Production, Event Management, Marketing, and Sponsorship Sales. As a niche recruiter, we specialise in the B2B conference & exhibition sector, this includes international media and publishing companies as well as professional bodies and charities. The B2B and commercial side of the industry has 4 key areas or stages known as the ‘event life-cycle’. The event life-cycle consists of Conference Production, Event Management, Marketing, and Sales which integrate, flow, and rely on each other to deliver a successful event. Conference Producers are at the forefront of the life-cycle and generate the ideas and topics. The role of a Conference Producer is to research and create current, exciting and commercially viable programmes within a particular industry such as Law, Commodities, Finance and the Public Sector. It’s much more than a simple Google search! Conference Producers talk to key players to find out what’s hot and trending in the sector and develop networking and knowledge opportunities for delegates. The key attributes of a Graduate Conference Producer are educated to degree level (2.1 & above) in a research/academic subject, analytically and commercially minded with strong communication skills to engage and persuade stakeholders at all levels. It’s highly advantageous for graduates to have experience undertaking an internship or have worked in a business environment. As an entry-level producer, you can expect a starting salary of between £22,000 - £24,000 per annum with profit share bonuses. Event Coordinators are operational focused, they assist in the organisation and delivery of events, conferences, and exhibitions from finding a venue right through to post event feedback. They’re the key point of contact between all stakeholders including sponsors, exhibitors, speakers, suppliers and internal staff. Event Managers bring the event to life and are responsible for venues, catering, AV, managing budgets, as well as providing first class customer service! A common trait amongst all Events graduates is a high level of organisation and project skills to succeed in a fast-paced and deadline driven environment. Entry-level positions begin from £18,000 - £22,000 and flexibility is essential to travel internationally when required. Event marketers promote events via a mix of direct and digital channels to a targeted audience. After creating planned and timely marketing campaigns, a Graduate Marketing Assistant will support in driving delegates to selected conferences, seminars, and exhibitions within a portfolio. The aim of the events marketing team is to increase revenue streams, which ultimately contributes to the overall success of an event. As an Events Marketer, you can expect to handle briefs, create and implement marketing plans, database management, copywriting, email campaigns, and analyse competitors, past campaigns, response rates, and implement new channels. Graduates will receive training and ongoing development in digital marketing tools which can include social media, SEO and PPC. Our clients require candidates to be degree educated with a strong academic record, analytically minded, and maintain a high level of copywriting and communication skills to forge a successful career in events marketing. Sponsorship Sales is the acquisition of partners and companies who pay to sponsor your conference or event. The Sponsorship Sales team is responsible for picking up the phone and pitching to clients and selling high value Event Sponsorship packages. Graduate Sales Executives will learn specific techniques to engage high level decision makers and make them aware of the commercial advantages of sponsoring an event. On a daily basis, the role entails being proactive on the phone to existing clients and generating new business leads. An ambitious and tenacious mindset is key, to exceed financial targets and KPIs. Another important element of the job is nurturing your client base and forging long term relationships to ensure repeat business. You will get to attend the conferences and events to network and liaise with your sponsors to build upon relationships. The qualities our clients look for are a confident and persuasive phone manner, strong negotiation and rapport building ability along with resilience and a desire to succeed. A typical starting salary for an entry-level position can range from £22,000 - £25,000, but hungry and money motivated individuals can earn up to 60% of their basic salary again in commission.